Camogie means a lot to the Light of Christ (LOC). It stands for team work, excitement, trepi- dation, anxiety, elation, and sometimes disappointment. It brings with it all the enthusiasm of match day, all the discipline of training, all the emotions that go with winning and losing. Light of Christ is a small country school tucked away in Dunmore East. Our girls have the huge advantage of the facility of the Gaultier Club where they can join and train for their national sports under the watchful eyes of the wonderful people, that give up their time and energy, to bring sports to the children. It was through Gaultier Club that LOC first entered the schools leagues way back at the start of the 2010s. We did not possess a kit for the girls to play in! It was a matter of ‘good looks don’t boil the pot’ which meant, even if the other team looks more professional than us, does not necessarily mean they will be better than us. We won the county mini-7s in 2003 wearing our school uniform P.E. 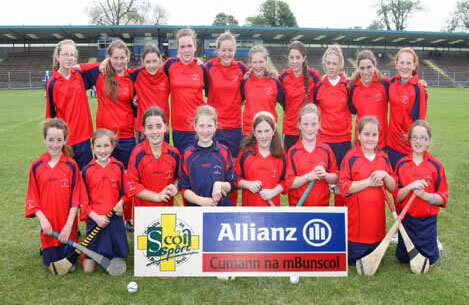 kit and one of the girls went to represent the school in Croke Park at the all Ireland that year. We have spent many Wednesday afternoons heading off to matches, in car loads to vari- ous playing pitches in the county, meeting different teams. Tactical plans are laid, as well as sweets chewed and chocolate eaten during these journeys! Our hard work and dedication paid off as we moved up from Roinn B to Roinn A in 2007, as we won the Eastern Final of the league that year. This year we fought so hard to win across the whole county. We had 19 girls involved in the team this year, the largest number to date. This is out of possible 90 or so girls. The team this year, indeed, all the teams in the past, are always complimented on the fact, that they are so encouraging and posi- tive to one another. The LOC girls know that if you don’t have something good to say, say nothing at all. Praise each other, communicate with one another, and give each other support. Play as a team and you will always be a winner. There is no ‘I’ in team as we all know and playing camogie really teaches the children this. To stay focussed when you are losing, to keep trying and not give up, losing grace- fully, these are all fundamental life lessons that camogie has brought to LOC, not just to the team but all students. LOC could not participate in the matches if it were not for the parents and teachers. There is no extra funding for buses so the team rely on the parents to bring them to and from matches. My camogie parents are so dedicated to the children and the school. There is never a child left behind. The parents always find a way to have enough room for all the team and are always on hand to help on the pitch. For a teacher responsible for a group of children that kind of support is priceless. The teachers in the school also facilitate by juggling their workloads to allow students to go to matches. 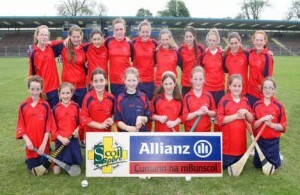 Camogie in the LOC is a whole school effort. We now play in a professional looking kit provided by our ever supporting camogie parents. We look the part! Those jerseys were presented to us by John Mullane and Noel Connors in October 2010. An exciting day for the school! Every child in our school has handled a hurley due to the efforts of the students from WIT who come to the school to help train our girls for a period of time each year. 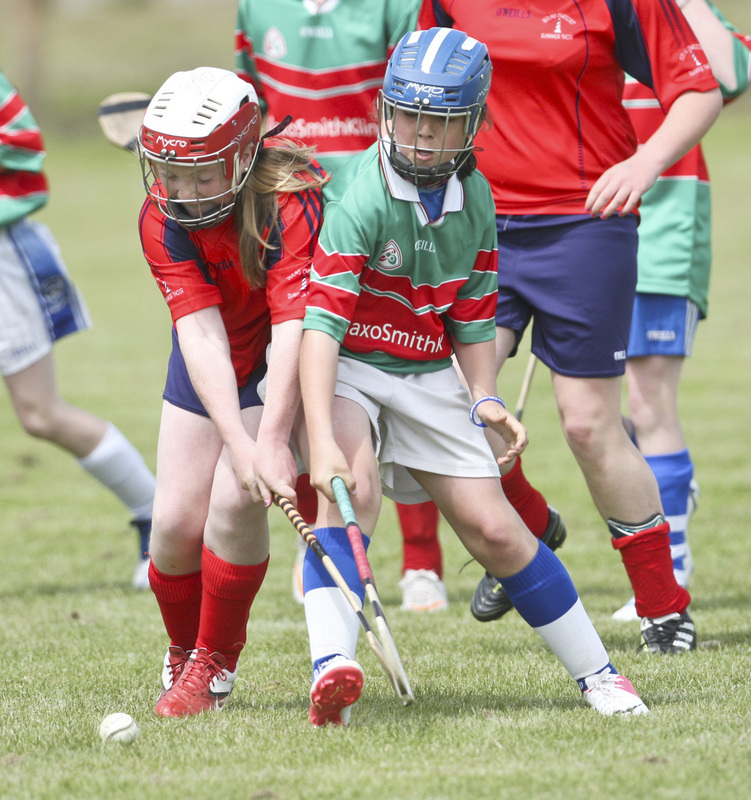 Camogie is a mainstay in the LOC. As we have such small numbers I sometimes have to go to fourth class to pick my league team. My girls are the most courageous, focussed, toughest little women I have the honour of dealing with. Most of all, win or lose, they give the school a sense of team spirit and make us proud!